1) I don't think Apple maps in iOS 6 are that bad. They're very pretty, fun to play with, just kind of useless if you'd like to look things up or ask for directions. I also know they'll improve over the next few months as users report problems and Apple makes deals with Map data providers around the world, such as Sensis in Australia. 2) The following is written with the benefit of hindsight, having watched the Maps debacle unfold. Apple may have thought their Maps were good enough. Perhaps the data providers of the world played hardball in the weeks before iOS 6 dropped. Who knows. All I can comment on is what actually happened, and what we've learned over the last week. The first great commentary around the Maps app came from Jean-Louis Gassée, a former Apple executive who rightly stated that Apple overhyped their new Maps application at launch. Gassée believes Apple should've launched Maps as a beta product, like Siri, and not as the new definition of the perfect Maps app, as Forstall portrayed it to be. I agree with him there, but Gassée goes on to say that Apple really had no choice but to switch from Google Maps 'sooner rather than later'. He takes the "rip the bandaid off" approach, that it was smarter to build the new Apple maps data with active users, regardless of short term pain. A few days later we learnt that it was Apple, not Google, who ended the Maps in iOS contract a year early. We're told that "Google was caught off guard" by the sudden end to the contract and this is why we shouldn't expect a new standalone Google Maps app any time soon. While I'm sure Google probably should've seen this coming, and could probably release a working app soon, I understand why they'd be happy to allow Apple to take the blame for all of this, and take there time releasing an iOS app. In the minds of the average iPhone user, Google did nothing wrong. It was Apple who screwed up here. So knowing all that, here's what i think should've happened. 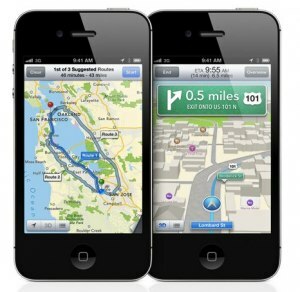 Apple should've kept the Google Maps contract and App as it was and released their own app as a beta product. They could've touted new features like vector tiles and turn by turn, but stated the new App is not yet ready for daily use, but urged users to play with it and report issues to improve it. If they did that, they would've taken the pressure of the new Maps app to be as good as Google from day one. I know some of you might be thinking that they need users to report problems to improve Maps, and thats why they 'ripped the bandaid off', but really, who are the kind of people that will report problems in Maps? Is it the average end user? Of course not. It's the fanboys who have spent the last week telling the rest of us to stop complaining and just report problems. I do love it when Google (or Twitter or Facebook) critics feel the need to tell me that I'm the product being sold to advertisers when I use a free, ad supported product. Every time they point this out, it's like they're the first person in the world who's ever truly peeked behind the curtain, who has figured out how the world works. These are the people who would've been happy with Apple's substandard maps from day one. Happy to report the errors they find. The rest of us would just like to find the thing we searched for. Apple could've had a year left with Google to get their Maps up to scratch. To allow the Tripview's and Metro Melbourne's of the world to work out how to become transit apps for their new service. To allow the fanboys to report problems, while still letting the rest of us have a great user experience from an App we use daily. I know it's not the end of the world for Apple. Google Maps will eventually come out and Apple maps will eventually improve - but in the meantime, it's a shame this whole debacle could've been avoided.